This homemade chicken soup recipe makes a batch of chicken soup brimming with flavor - the best I've tasted. My version of the ultimate feel-good food is full of vegetables like mushrooms, onion, carrots and celery. It is easy and makes the best soup you have ever tasted. Boiling chicken is the key to this homemade chicken soup recipe. You may also use legs, breasts, thighs, but leave the skin on to make the broth delicious. 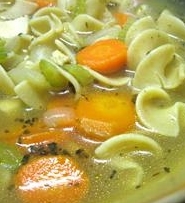 My homemade chicken noodle soup recipe (photo) is the same, except (of course) you add noodles. I usually do not put noodles in the soup anyway because pasta soaks up all the broth - especially if it sits for a little while. I just add the hot buttered noodles when serving. While the chicken is cooking, make the homemade pasta. In a large stock pot, add all ingredients; fill with water. Bring to a boil and simmer for 1 to 1-1/2 hours, or until chicken falls off the bone. Place a colander inside a large pot and strain the broth from the chicken. Pick through and add the chicken meat to the broth. If you want noodles in your soup, here is the recipe. Beat egg yolks, adding water and salt to make a stiff batter. Knead in the flour. Roll out to let dry. Cut into strips approximately 5 inches long and 1/2 inch wide (or whatever shape and size you need them). Dry at least an hour. Bring salted water to a boil and cook until tender. If you do not add the pasta, you have chicken soup. You can also add dumplings instead of the noodles and have homemade chicken dumpling soup. So versatile and so delicious. Served with a warm loaf of homemade bread. You may also make this overnight in a crock pot if you wish. Just add the noodles the next day.